The dress shown on the cover does not match the practical dressmaking discussed in the book. 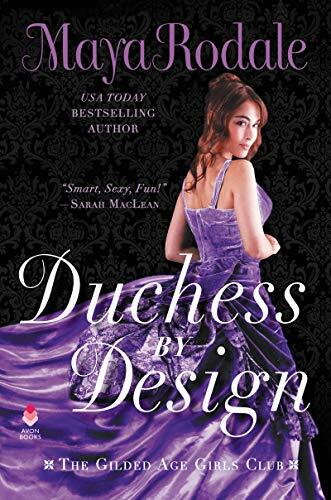 Maya Rodale’s 2018 Duchess by Design is a great story, with a perfect balance of romance, humour, and social commentary. It’s 1895, and the Duke of Kingston has inherited an estate in desperate need of funds. His solution, a common one at the time, is to travel to New York and wed a wealthy heiress whose family desires a title. On his first day, he bumps into an attractive young woman of means, staying at the same hotel, and is instantly smitten with her looks and her forthright manner. Adeline is a smart, hardworking, and ambitious seamstress. She considers fashion a way for women to get noticed, and taken seriously, in society. She’s also determined to make fashion practical, by radical means such as adding pockets to gowns. En route to alter the gown of a society matron, she bumps into a handsome and charming duke. He catches her when she falls, and while she’s impressed, his conversation confirms her assumptions of him. He flirts with her when they subsequently share an elevator, and is amused by her playful but disinterested responses. He soon discovers she is not an heiress. Marriage is out of the question, and when he causes her to lose her job, she wants nothing further to do with him. He finds a potential bride, but seeks out Adeline at her new and struggling dress shop. She informs him that his intended may not be the wealthy woman she appears to be, and they decide to work together. She will accompany him to social events to assist him navigating the dating hazards of New York society, and she will benefit from the publicity her dresses receive. It will be a strictly business arrangement, or so they both tell themselves. Two things greatly enrich the plot. First, the setting. This is the nostalgic New York City, and America, of opportunity and possibility. I was reminded of Mark Helprin’s Winter’s Tale, though Duchess by Design begins in the spring. There is a similar sense of New York City as a magical place. The celebration of entrepreneurship, common in romance novels, fits well in this time and place, but there is an emphasis on community support. Kingston and Adeline both need help to make their dreams come true, and both use their success to help others. Duchess by Design is first in a series called The Gilded Age Girls Club, and the time period is sometimes referred to as the Gilded Age, but the term has mixed associations, as it originates in a Twain satire of greed and corruption. and is sometimes associated with social protest novels. Indeed, this novel has elements of social protest, its second strength. When Kingston’s attentions cause Adeline to lose her job, she lectures him on their relative experiences of poverty, and the challenges of a woman needing to maintain a spotless reputation to remain employed. Adeline had a vision of women followed around by men who purpose was merely to hold things for them – human pockets, essentially. Like horses, they would require feeding, watering, and long pauses to rest their legs. Other conversations are darker, such as when she explains why she tolerates the harassment of a client’s husband. Some of the social protest is less direct, but no less obvious. Adeline and friends attend a speech by real life activist Emma Goldman, who calls for the sexual liberation of women, and an organization of women plays a significant role in the plot. As the author notes in an afterword, historical personalities, trends, and organizations were incorporated into the story, but they raise contemporary concerns. Women’s clothing still routinely lacks pockets, and the secret women’s business organization in Duchess by Design reminded me of the secret women’s sexual liberation organization in S.E.C.R.E.T. In the tradition of the best historical novels, Duchess by Design uses the distance of time to comment on contemporary issues. There are also comments about romance novels, and it is itself a thoroughly satisfying romance with solid twists and turns. There are a couple of steamy scenes, well-integrated into the story, and the writing includes not just the witty dialogue and humour I’ve already mentioned, but other techniques such as moments of repetition used to great effect. I am looking forward to the rest of this series.